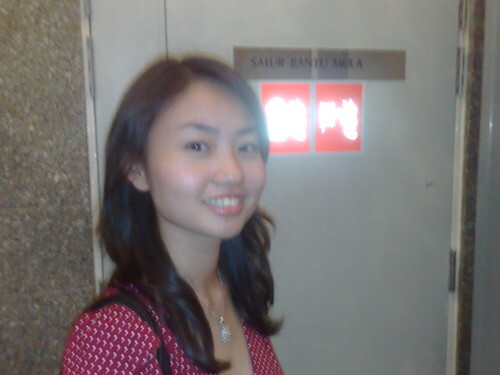 The last time I visited KL Tower was nearly 10 years ago, for my 14th birthday. Dinner with family and my best fat buddy. 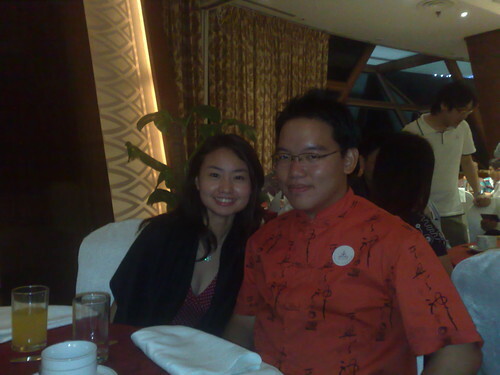 We dined at the revolving restaurant, it was a magical night for the atmosphere and joy, but because the food weren't spectacular, I never really thought of going back. So I didn't. It never occurred to me that it had already been ten years since I was there until I stepped foot into the KL Tower yesterday evening (it's 1:36am when I'm typing this now). 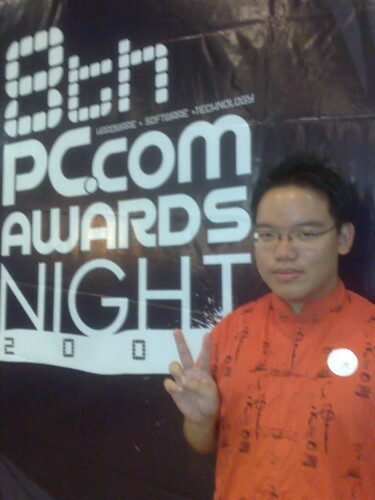 I was invited by Erna to the 8th PC.com Awards Night after helping the magazine do the opening video for their event (which I mentioned about when explaining my recent lack of updates). And hell, I was just as excited as any tourist, or maybe my excitement stemmed from the fact that my video was going to premiere there, in front of a few hundred people, some of them were important bigwigs from the tech industry. I was accompanied by my cute buddy, Grace (who acted as the Rabbit Fairy in my short film, GIRL DISCONNECTED and also appeared as Albert's Daughter in the ending of the telemovie CINTA TIGA SEGI that was aired last Sunday, she's a busy, highly in-demand actress now). She had never been to KL Tower, so she was heck excited too. So the following are photos we took of each other before we took the lift up to the revolving restaurant, where the awards night was held. Then we went to the top of KL Tower and waited for the event to start. Grace told me she saw Yasmin Ahmad in the restroom, I froze, wondering why was she invited too. Moments later, a very striking (and familiar-looking) woman walked in and spoke to Erna, and then left. Grace pointed at the woman who had just left and told me she was talking about her. 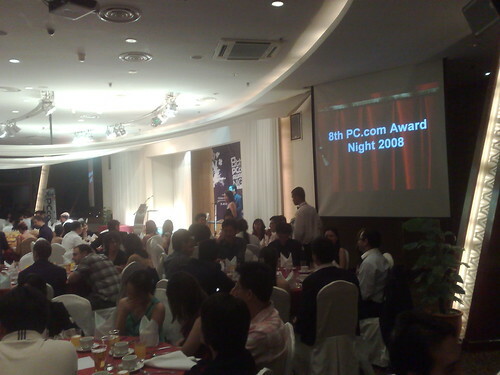 The woman turned out to be Elaine Daly, actress and Miss Malaysia Universe 2004, emcee for the night. And no, I still don't understand how Grace could mix her up with Yasmin. And my video (which I can also consider as a new short film) was shown in three screens instead of one! To have my video shown in an event like as lavish as this, the Oscars for the Malaysian tech industry, was a remarkable experience. And I felt relieved when I heard people laughing really loudly at the right parts, and even the really deadpan parts which I didn't expect to generate any laughter from. I was definitely happy with the loud applause when the video ended. Just a week ago, I hadn't expected myself to actually make a short film that's marginally presentable when it was supposedly going to be shot entirely with a Nokia N95, and I hadn't really met any of the actors until the actual day of the shoot. Not having rehearsals and a good cinematographer for a film had always been personal no-nos for me. Grace and I left the event relatively early. The night really belonged to the tech players, after all. Although we did enjoy our time there, and the food, haha. Took some photos before we left KL Tower. 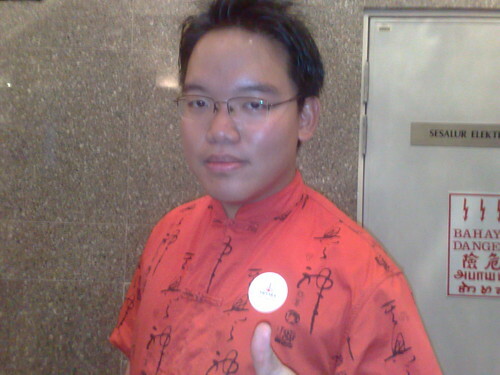 I wonder whether it'll take another ten years for me to return to KL Tower? As for the opening video, I'll be doing some minor editing so it can work as a standalone short, and yes, I'm most likely posting it up on Youtube. Look out for it, I might even write about my thoughts of the swift production of the video (3 days, two days of shoot, 1 day of editing), in which The Great Swifty was truly swift indeed.